With the sights of Jack-o-lanterns and harvest scenes lining nearly every doorstep and shopping center, it’s no wonder that pumpkin is the official flavor of all things fall. But lugging a pumpkin into your shopping cart at the supermarket just doesn’t carry the same appeal as traversing through a real pumpkin patch, searching for the perfect gourds to complete your fall décor. Luckily, South Carolina knows no bounds when it comes to fresh farm pumpkins straight from the source. So ditch the grocery store lines, and check out the best pumpkin patches in South Carolina. Enjoy a solo exploration of Farmer Sease’s Pumpkin Patch, or reserve your spot on a guided two-hour tour. Either way, you’ll find the perfect pumpkin to complete your Halloween or harvest theme. An Upstate favorite for over 13 years, Denver Downs never lacks in the things-to-do department. 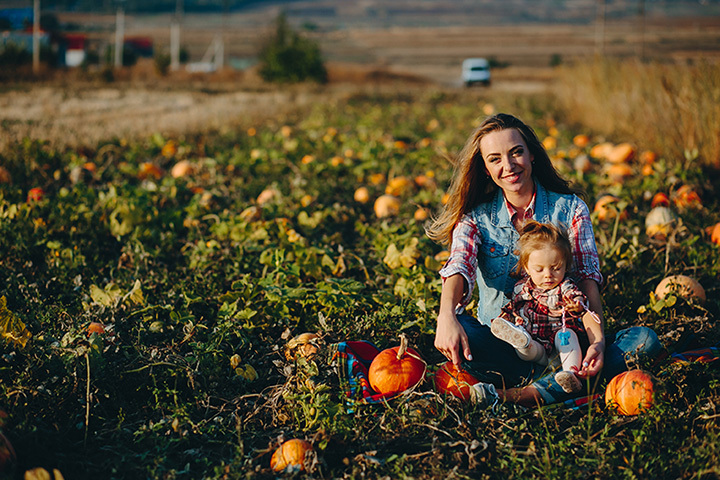 After you pick your perfect pumpkin, head over to the more than 35 other family activities, like hay rides, the tube slide, and a corn maze filled with trivia at every twist. Open every weekend in October, Legare Farms brings some of the best fall farm activities to one central location. A $1 admission gives you the green light to the playground, mini maze, and barnyard, but you can pay a la carte for other activities, like pumpkin picking, duck races, gem mining, the scarecrow factory, and horse rides. Even with thousands of pumpkins up for grabs, the popularity of Stewart’s Farms ensures a bare bone inventory when the season ends, so come get yours quick. While you’re there, check out the seven-acre maze, relaxing wagon ride, and the largest selection of mums in the Upstate. As if you needed another reason to love the low country of South Carolina, Boone Hall Plantation is the go-to destination for fall-loving folks. They charge a $10 admission, but that gives you access to all the attractions, like the corn maze, giant slide tower, rock climbing wall, spider web (don’t become dinner!) and the pumpkin patch. Pick your pumpkin and pay by the pound, and don’t forget to visit the tent housing delicious fall edibles. You’ll find more than just pumpkins at Berry Acres Farm. Get your exercise winding through the corn maze, then take a break on the hay ride. Adventure-seeking visitors can coast down the 150-foot slide, zoom across zip lines, or pounce on the giant jumping pillow. Plenty of other activities await, but only on the weekends during the fall. Lever Farms may be renowned for their delicious strawberries, but when fall rolls around, they turn the tables to all things pumpkin. Every Saturday in October, the gates open for pumpkin picking and wagon rides through the fields. Make sure you get lost in the corn maze, pay a visit to the farm animals, and earn your bragging rights with a rousing game of pumpkin bowling. The Great Pumpkin Patch—and so much more. A $10 admission paves the way to every activity: duck races, Haytona Speedway, the Barnyard Zoo and, of course, the Great Pumpkin Patch. Open for the entire month of October and the first day of November, you’ll get your fill of all things farm life here. A full day of adventure awaits you at Thompson Farm & Nursery. Come meet Pippa the Pumpkin Princess and Willow the Witch for story time. For $7.50 (plus tax), you can take a tour of the pumpkin patch, feed the farm animals, go for a romp in Pappy’s Play Area, and take home a small gourd of your own. And don’t forget to stay for the fireworks!